Abdomen is large and round as fetal liver is producing blood cells. 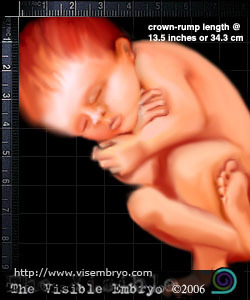 Fetal size: weight a little more than 6.8 pounds (3.1kg). Crown-to-rump length hasn’t changed much; it’s still about 14 inches (35cm). Total length is around 21 inches (47cm). Mother's size: From the pubic symphysis to the top of the uterus, measures approximately 14.4 to 15.2 inches (36 to 38cm). From your bellybutton to the top of your uterus is about 6.4 to 7.2 inches (16 to 18cm). Skull is not fully solid as the five bony plates, known as fontanels (little fountains), are still separate and can be pushed together. Birth may mold and elongate the fetal head, a safety precaution to reduce the skull's diameter for an easier birth, without damaging the fetal brain. After delivery, the baby's head returns to a rounded shape. Eyes have no tear ducts yet, they appear a few weeks after birth. Chest is more prominent. Lungs begin to increase production of surfactant to keep alveoli open. Last of vernix usually disappears, but may remain until birth. Skin becomes thicker and paler (white or bluish pink) and each day the fetus gains 1/2 ounce (14 g) of fat.